About Designs by Inspiration, Inc. 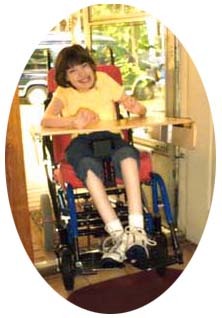 Designs by Inspiration, Inc. is owned and operated by the parent of a brain injured child. The companys mission is to develop products that will enhance the lives of individuals with developmental delays and neurological disorders. As a parent, with 23 years of experience home schooling her daughter with developmental delays, I understand what the special needs population and their caregivers need to assist them in daily living activities and therapies. Meredith is more than my inspiration. She is my #1 model and business associate. As she likes people to know, were GIB (girls in business). Designs by Inspiration is represented by the colors blue and pink, Merediths two favorite colors.